Events! issue | In-Water Boat Show – LG Pier. Hemmings Councours car show in Lake George. 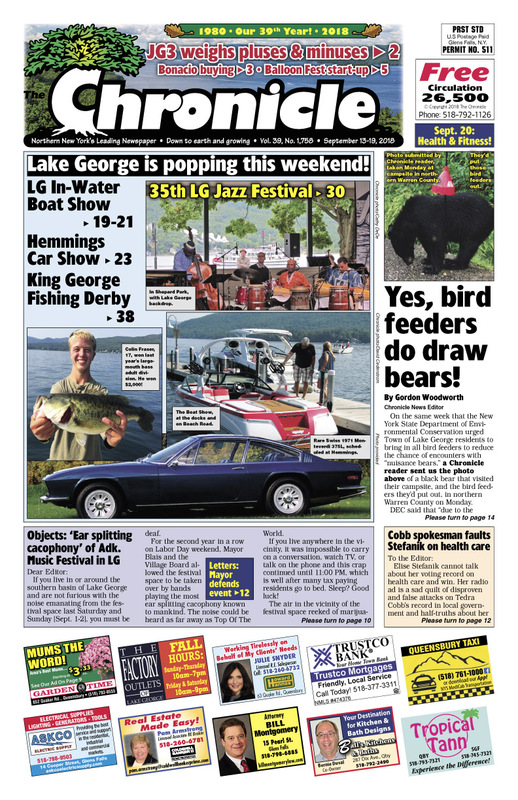 Lake George Jazz Festival. King George Fishing Derby. Bears and bird feeders. Joseph Girard III’s selection process. Bonacio under contract to buy Sandy’s. The future of Aviation Mall. Adirondack Balloon Fest opens in Glens Falls on Sept. 20. Taste of the North Country. Park Theater ‘in flux’ as Siplon departs. $10,000,000 scratch off winner in Fort Edward. Pages of real estate listings… Find your dream home! Concerts, comedy, shows… The Chronicle always has the region’s best Arts & Entertainment section!